I know the trend lately is to paint fireplace brick white. Especially if the brick is an ugly bright red or some other ugly color. I’m pretty sure that is why our fireplace was painted in the first place. But, the fact that our fireplace, mantle and the built-in bookshelves on both sides of our fireplace are white, made for an overwhelming amount of white on that one wall. I thought about painting the mantle, but only briefly. I really wanted the warmth and contrast of bricks to set off all the white in our living room. I wasn’t sure how it would turn out, but in the end I am amazed by how real it looks. And, how easy it was to do! The true test came when I fooled the builder of our house (he has lived on our street for over 30 years) into thinking I had stripped the paint off the bricks! Sweet success. This is a relatively easy project. It took several hours, but can be done in sections. After working up a test board by playing with several color combinations, I chose a warm brown brick color. I also tweaked my mortar color before painting it on my fireplace. I covered the mantle and bookcases by taping newspapers to them. Then, covered the floor with a drop cloth. I mixed up a small container of my mortar color. I used some leftover latex satin taupe paint from our other house and added some black and a little dark brown to achieve the perfect mortar color. I painted all the mortar areas between the bricks with a 2″ paint brush. As the mortar color dried, I mixed up a bucket of my base color for the bricks. Then poured it into a paint tray. Then, I laid out my seven paper plates and filled the first one with a deep chocolate oops paint (Valspar Latex Eggshell Chestnut). And poured a half dollar size of the following colors onto the other plates (one color per plate). While the base color was still wet, I covered my sponge with the Chestnut color. Then dipped the sponge into one or two of the brick tint colors. I sponged one brick at a time using the same color tints sporadically around the wall. Keeping the brick colors varied and random make them look real! When the sponge needed to be reloaded with paint, I began with the chestnut color first, then added one or two new color tints to the sponge. You will have to refill the paper plates as you use up the paint. I kept working in small sections, to be able to work while the base color was still wet (use the spray bottle of water to lightly wet the bricks if it dries too quick). The best part was that if I didn’t like a color, I could go back over it and try a different tint. Notice how I randomly dispersed the darker brown bricks. This is key to having a realistic look. On the hearth I had to press more gently with the sponge since the mortar lines on our hearth were almost level with the bricks. I kept a wet rag near by to wipe up any wandering brick paint. Close up picture of the bricks. look like they are re-claimed and rustic. Daylight picture after decorated for the holidays. Side note: The latex and acrylic paint has held up great (even after several fires using our gas logs.) 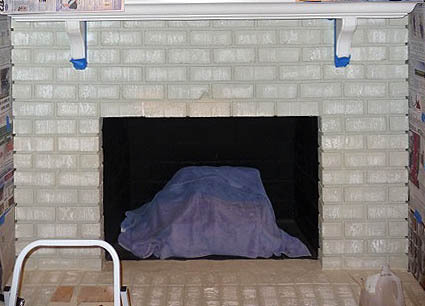 If you need to paint the bricks inside the firebox, you will need to use paint that is heat tolerant. And for those wondering how long this took. Including the prep work (cleaning, taping, mixing colors) it took about 5 hours total. Not too bad since I’m a night owl and could watch DIY network while painting! Be careful not to put anything heavy on the hearth for a few weeks while the paint hardens. Next up in the series: 5 Ways to Lighten up a Dark Room. Followed by: Painting Decorative Graphics on Your Wall. I have an ugly white fireplace, but after seeing what you’ve done, it won’t be white much longer! This is amazing! I never thought I could recreate a natural brick look, but thanks to your directions and pictures, I can do this! We tried this out on our ugly painted over brick fireplace over the weekend and it came out great! It didn’t even take as much time as I thought it would to paint over each brick. Thanks so much for the tutorial. Our living room looks cosy and warm and we love it! So happy you found the tutorial helpful. Awesome job with the fireplace and built-ins. I want to do something similar in our living room. I couldn’t tell from the photos but did you paint the entire inside of the built-ins green/slate or just the back of them, leaving the individual shelves white? In other words, is the interior left, right, top and bottom of the bookshelves green/slate or just the back of them? Thanks for the help and clarification. Feel free to reply to my personal email address if you wish. Also, would you mind including a panned out photo of the entire wall so my wife and I can see what the entire finished job looks like? Great job!!! I love the end result! It looks amazing! Thanks so much! This is what I’ve been looking for! When I moved into my house, the fireplace looked as if it had been painted with Wite-Out. Yuck! We painted it a pale yellow, but after seven years I am really tired of it. I’m going to give this my best shot and see if I can make mine look as good as yours. Fingers crossed! Good luck Laura. I know you can do this. I’d love to see a picture when you are finished. I have a question, did you dip the sponge in the chestnut color and 2 or 3 other colors before using the sponge? Or did you press the darker color first then add the other colors? I used random colors and switched it up to get a variety of “brick” colors. I recommend using a practice board to see what you like. I’m thrilled to have found this blog because you’ve done exactly what I’ve been contemplating for months. We are restoring our 1947 ranch which unfortunately the previous owner painted the (narrow, horizontal) brick fireplace white many years ago. I couldn’t see a way to strip the paint (most people say it’s a no-win) but I can’t leave it this awful white. I have no qualms about this project (I’m an artist by profession) and it’s good to hear you’ve had good luck with the ‘craft’ type paints you used. Thank you SO much Brittany!